This recipe comes from my time baking in Portland, Maine. 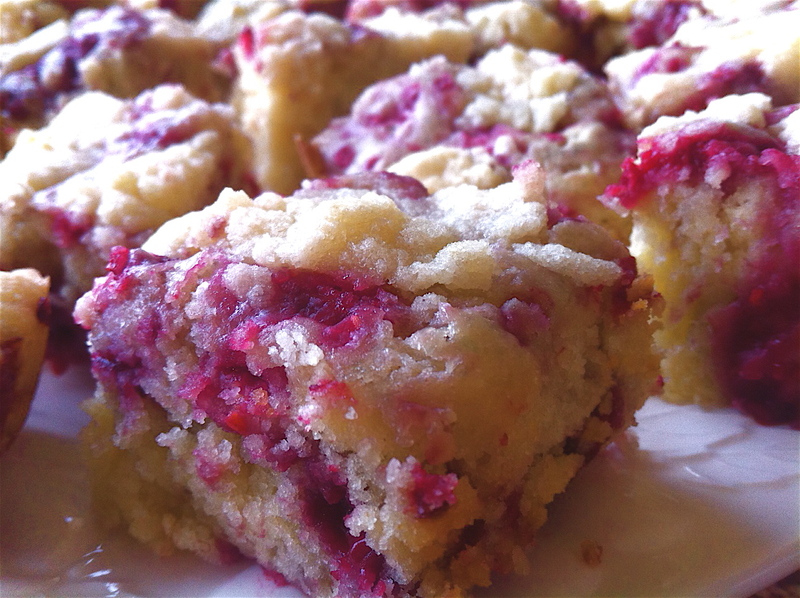 We sold two types of coffeecake each day, and people always asked for this Raspberry Crumb Cake. It’s a very moist cake filled with juicy raspberries. The middle parts melt in your mouth and the crumbly topping adds a buttery, crispy texture to your eating experience. It’s a very versatile recipe, so you can change up the flavors by adding different types of berries, different extracts, and even chocolate chips. It’s the perfect accompaniment to a Sunday brunch or luncheon with the girls. I like it for these occasions because it’s baked in a baking dish, as opposed to a tall tube pan. This means you can have smaller pieces, and just have a nibble instead of a humongous pastry. I chose to cut them into 2 x 2 inch squares, for a total of 16 pieces. If you wanted it to be more substantial, cut the cake into 2 x 3 inch bars for roughly 10 servings. Preheat the oven to 350 degrees. Spray an 8 x 8 inch baking dish with cooking spray. Beat the butter and sugar together with a mixer until it is light and fluffy, roughly 3 minutes. Add the egg and vanilla, mixing until everything is combined. Add the baking powder, salt, and 1/2 cup of the flour to the mix. Mix for just a few seconds before adding 1/4 cup of the milk. Mix again until just combined. Repeat this step two more times, rotating flour and milk, until everything is just combined. Do not overmix! Remove the bowl from the mixer. Add the raspberries and fold with a spatula until the raspberries are scattered throughout the batter. Do the best you can to avoid smashing the raspberries, other wise the entire cake turns pink. Put the batter into the baking dish, spreading it completely into the corners and evening out the top with a spatula. Rinse the mixing bowl out and dry completely. Add the sugar, flour, and butter for the crumb topping to the bowl. Mix with your hands until the topping feels like wet sand. It should remain in chunks, and not over-mixed into one big ball. Spread the crumb topping over the top of the cake. It doesn’t need to cover the entire thing, just scatter it around as evenly as you can. Bake the cake for roughly 30 minutes, or until a toothpick comes out clean from the center of the cake. Remove from the oven and let it cool completely. You can slide a knife around the edges of the cake and remove it whole by flipping it onto another plate. Otherwise, cut the cake into your desired serving size, and put into cupcake liners for serving. So good! I am always looking for quick and easy ways to consume our giant raspberry harvest (they are so much work, and we have so many, and the darn things come all at once, but are so good!) and this recipe is fantastic – thank you! I’m so glad you like this recipe! It is one of my favorites! !